Hey there, it’s been a while. Time goes by fast when you’re working on stuff. For the past couple months, I’ve been working on a side web project. 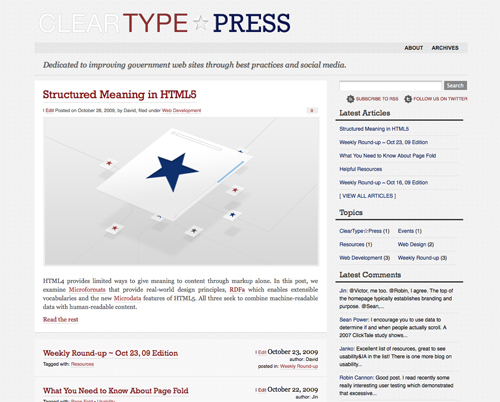 ClearType☆Press was launched a month ago. It is a web design and development site. Well, the focus of ClearType☆Press is on improving government web sites. As I mentioned in the past, I feel most government web sites out there are far behind current industry standard in terms of code standard, design, usability and use of social media. This is true for governments all over the world. Government sites need so much improvement. Recently I am more compelled to do my part to contribute. If a company’s web site isn’t up to standard, then users complain, or stop using that company’s service. Bad website equates to bad branding, and it affects consumers’ perception of the company. That’s why within the private sector, company sites are usually up to date. What about the government sites? Government serves its people. The websites are part of that service. In the past, most government sites simply were set up as a data dump. There’s been very little thoughts on design, usability and branding. The underlying code is also badly written. Of course it’s easy to be a critic. ClearType☆Press is my attempt to help. What’s different about government web design from designing for other type of sites? Design and coding wise, there’s none. However, there are many constraints that are unique to the government sites. Accessibility for one. Government sites are required by law to be accessible. Unfortunately, most are not. When it comes to social media, a government agency can’t just sign up an account. Government sites are not allowed to use tracking cookies, therefore they have to jump through some legal hoops to use social media sites. The topics I plan to cover on the site will include design, development, accessibility, usability, social media and event coverage. Luckily, I’m not doing it alone. My colleague and friend David Lantner and I started the project together. He’s one of the best front-end developers I’ve worked with. He is also a lot more knowledgeable about accessibility and new HTML5/CSS3 than I am. You can help too! Please visit ClearType☆Press and leave some comments on the articles posted so far. Also, if you’re interested in writing an article for the site please let us know. It can be about any government, not just the U.S. Our governments have the resource to create much better web sites, we can help. Briefly about the site design process. Function wise, I wanted the site to be easy to read and simple to navigate. After all, it’s a blog site. Visually, I wanted a clean look, with the influence of traditional print elements. I also wanted it to reflect a government related theme, but not screaming “USA! USA!” I think the subtle use of blue/red stars as accent ornament/colors help. As always, I’m a firm believer in content is the king. Most of the design elements on the site are simple typography, layout and white-spacing. To offset the traditional look, I created some consistently themed graphics to go with each article. I like the combination of gray, red and blue. They fit the branding of the site well, IMO. There are still many little things I’m tweaking on the site. Lastly, I’d like to thank many designer friends whom I met online. 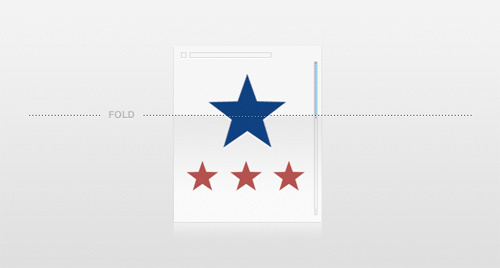 During the design process of the new site, they provided me with invaluable feedback. Thank you so very much Aja, Alex, Sander, Dmitry, Nathan, Soh, and Janko. Great work, Jin. Although ClearType is focused on government sites it is an enjoyable read for all web and ux professionals. And yes, the design is really reflecting the idea behind the site. Good job, congrats on the launch! I really love those branded illustrations you’ve got for each post. It’s good you’ve found a niche. it’s one that really does need a lot of work, so nice one. @devolute, definitely. I can see other type of sites need a lot of help too… Namely realtors’ sites. Great job! Just added Clear Type Press to my favorites.